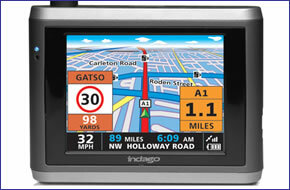 Snooper Indago Portable Satellite Navigation system includes UK and Ireland mapping. Snooper Indago guides you simply and effectively from door to door and also has the added ability to alert you to all 'fixed´ speed safety cameras and accident blackspots so you will arrive at your destination safely. Snooper Indago has been discontinued. Accessories, spares and parts are still available for your Indago. The Snooper Indago is pre-programmed with street level UK mapping. You can search and plan a route to your destination by simply keying in a simple street name, a town or city or even just the postcode. Regular routes can be saved in a 'Favourites´ file and can be reached in seconds and a separate file even records a history of your most recent trips so that you can return to them at the press of button. An extensive list of 'Points of Interest´ (POI) is also included. A touch screen makes using Snooper Indago simple, whilst a built-in rechargeable battery means that no permanent installation is required and there are no trailing wires, plus you can move it easily between vehicles. Snooper Indago utilises NAVTEQ street level mapping, ensuring that you can travel from A to B using the best route possible and more importantly, without getting you lost. Once your route has been planned, Indago will give you accurate turn by turn instructions to your destination with helpful voice prompts and a colourful, moving 3D map. Snooper Indago uses AURA, the most comprehensive speed camera database available offering you the ability to download new camera data seconds after it has been recorded in the database. No other Satellite Navigation system alerts you to speed cameras in quite the same way, with both audible and visual alerts confirming the speed limit, camera type and distance to the camera. There is no need to set the detection range of Snooper Indago, as Indago automatically calculates the distance required depending on the speed limit. For instance it will alert you 200meters in advance in a 30mph zone and up to 500meters in a 70mph zone. The Snooper Indago also recognises your speed. So if you are under the speed limit as you approach a speed camera or high risk zone it will only give you a visual alert. Of course if you are over the speed limit you will get a full audible alert including voice warnings. The Snooper Indago just blew us away. Voice prompts kept us on target the whole way and the GPS stayed locked on for the whole time, even in urban canyons. When we nearly ran out of petrol the "points of interest" option guided us to our nearest petrol station and then redirected us back on route. All fixed speed cameras were spotted well in advance and voice prompts counted us down in yards to the camera as well as letting us know the correct speed limit. Really stylish and definitely worth the price tag. The Snooper Indago is mounted on the inside of your vehicles windscreen using the suction cup windscreen bracket provided. The Snooper Indago can be powered directly either from its internal battery if it's fully charged or powered from the cigarette lighter socket. The Snooper Indago utilises NAVTEQ street level mapping for the UK and Ireland, ensuring that you can travel from A to B using the best route possibleand more importantly, without getting you lost. By using NAVTEQ digital map data, Indago is able to offer accuracy, detail, reliability, and flexibility providing you with a highly accurate representation of the detailed road network. To download and successfully update the Snooper Indago with software, sat nav map updates and/or speed camera locations via a computer you will need a PC running either Windows XP (32-Bit), Windows Vista (32-Bit), Windows Vista (64-Bit), Windows 7 (32-Bit), Windows 7 (64-Bit) or Windows 8 (64-Bit) with an internet connection. Please note: the Indago, as with all Snooper products, is not Apple MAC compatible. The Snooper Indago comes supplied with everything you need to use it in-car (see What's in the box? above), however replacement and additional Snooper Indago accessories are also available to buy from ActiveGPS. Question: Do you supply replacement batteries for Indago snooper SNP1000? The internal battery is labeled 060906. Answer: We do not and have never sold a replacement Snooper Indago battery. You could try the manufacturer. Question: I have a Macbook and can't find the software to allow me to update the Europe card for my Indigo. Can you help? Answer: The Snooper Indigo is not compatible with Apple computers. It is only compatible with Windows computers. Question: The sd card has been mislaid. Do you have any idea where or if I could purchase a replacement one? Answer: We no longer sell maps for the Snooper Indago. We buy all of our maps from Snooper (the manufacturer), who no longer issue mapping for the Indago. As for a place to purchase, you could try eBay, albeit for a second hand Snooper Indago complete with map SD card. Question: I have a Indago SNP1000 sat nav and I require a new car charger lead please. Answer: The genuine Snooper Indago car power lead was discontinued by the manufacturer (Snooper) some years ago. The only cable we can offer you as an alternative is a hardwire power cable. Please see the third accessory on this webpage. The cable is called: Snooper Indago Hardwire Power Cable with Fuse. Question: I've got a Indago Snooper SNP1000 which needs updating for maps and speed cameras. The version I have is 1.1.0.7, gb-10/16/2005, and ideas on what to do, I'd sooner sort out via internet. Answer: The Snooper Indago (SNP1000) was discontinued a number of years ago. We no longer sell map SD cards for the Indago, as we understand there are no new maps being issued for the Indago. Do you have a question about the Snooper Indago? Submit your question via our contact page.